Microsoft has announced that Halo: Reach, Bungie's final addition to the Halo franchise, will hit store shelves on September 14. A prequel to the events that began in the original 2001 release Halo, Halo: Reach follows the exploits of Noble Team as it makes a last desperate stand against the forces of the Covenant on the planet Reach. More than 2.7 million gamers haven taken part in the Halo: Reach beta, adding up to over 13 million online games and 16 million hours of online gameplay, making it "the largest console videogame beta test on record." 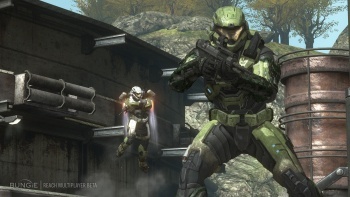 Calling it "the culmination of a decade of Halo," Phil Spencer of Microsoft Game Studios said, "Just as Halo: Combat Evolved catalyzed the success of the original Xbox to define a decade of entertainment, Halo: Reach will push the boundaries for what's possible in videogames and help make 2010 the biggest year in Xbox history." Despite being Bungie's last Halo game, Community Director Brian Jarrard said earlier this month that the studio plans to maintain support for the game after it comes out. "we have a great relationship with our community, so we want to make sure we keep the game going," he said. Halo: Reach will be released in three editions: Standard, Limited and the now-obligatory Legendary, which will come with a pile of extras including a ten-inch-tall, hand-painted Noble Team statue made by McFarlane Toys and a price tag of about 150 bucks. Serious fans only, please.